Kyle Wyman had another solid weekend at COTA on the new Ducati, but he’s confident of more to come at VIR. The SC Project/KWR Ducati team put up another pair of top-10 finishes this past weekend at Circuit of the Americas for the second round of the MotoAmerica Superbike championship. Kyle Wyman rode his Ducati Panigale V4 R to another stout performance considering the team’s early state of development on the new platform. Saturday’s race one was run in windy conditions, and Wyman suffered through the 15-lap race with handling issues, many of which caused by a sustained wind with gusts up to 45mph. He finished 10th despite running as high as 8th in the early laps. Wyman got a good start in Sunday’s race two, and was able to follow the lead group for the opening couple laps. He settled into a race long battle with David Anthony, and was able to hold off the Aussie for 7th position to finish up, lapping at nearly 3 seconds per lap faster throughout the race, compared to race one. With two rounds in the books, the MotoAmerica championship doesn’t resume until May 4-5, 2019 at Virginia International Raceway. The three week break will offer some time for the KWR team to regroup, improve the bike and come out swinging at the next round. Wyman expects there to be some new parts and updates on the way for the next round on the calendar. 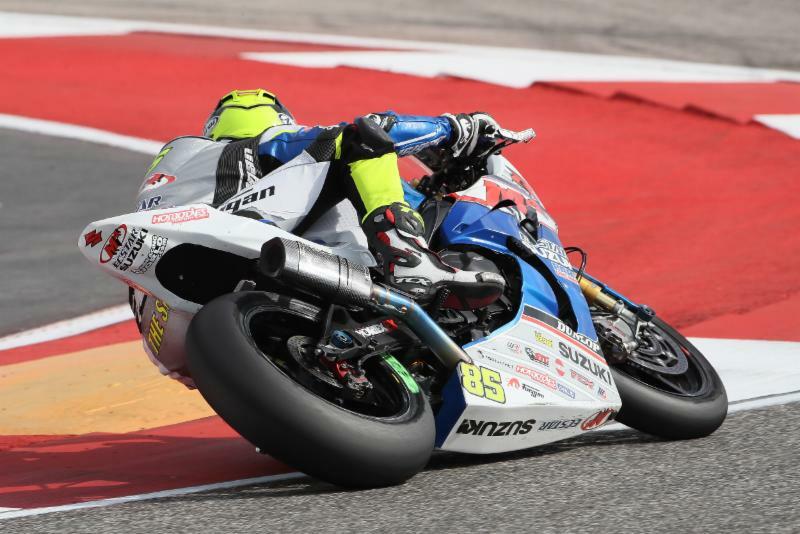 Westby Racing’s Mathew Scholtz has had better weekend than the one he endured at COTA. 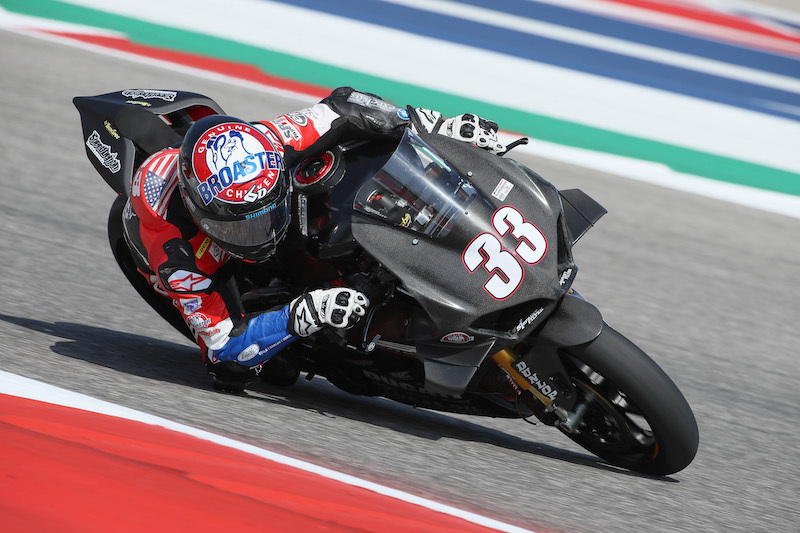 For Mathew Scholtz and his Westby Racing team, the 2019 MotoAmerica Superbike Championship of Texas at the Circuit of The Americas in Austin, Texas was a weekend adventure that they will not soon forget. In Friday’s Superpole final qualifying session, Mathew put the #11 Westby Racing Yamaha YZF-R1 Superbike in fifth position and on the second row of the starting grid. Early on Saturday, a massive storm replete with torrential rainfall, lightning, and high winds forced the cancellation of the morning’s free practice session, which prevented the team from fully testing the changes that they had made to the bike’s setup on Friday night. In Saturday’s Superbike race one, Mathew felt that the setup he and the team chose on Friday night was a little bit off. Early in the race, he ran wide and slightly off the track, but he was able to quickly rejoin the race. However, a few turns later, he lowsided the bike and slid gently into the gravel. Quickly remounting his essentially undamaged Yamaha, Mathew got back underway and recovered to finish seventh, which was a very solid result considering how much worse things could have been if he hadn’t been able to continue on in the race after the crash. After some more tweaks to the setup on Saturday night, Mathew recorded the fifth-fastest time in Sunday morning’s warmup session, which was encouraging for him and the team. In Sunday’s race two, things were going well until MotoAmerica race officials inexplicably signaled to Mathew that he needed to come into the pits. He dutifully rode his gold-liveried Westby Racing Yamaha in for the team to check over, but they didn’t find anything wrong with the bike. The race officials agreed with the team’s assessment and cleared the bike to return to the race. By then, however, Mathew was a lap down, but he faithfully soldiered on despite the disappointing situation and salvaged as many championship points as he could, ultimately crossing the finish line in 13th place. About the weekend at COTA, Westby Racing team manager Chuck Giacchetto said, “All in all, round two was a positive experience for us because we learned a lot and still left with valuable points, a tight program, and most importantly, a rider who is extremely motivated to take charge at our next round of the championship. “As I look back on the efforts of other teams that have not garnered success when switching to advanced electronics packages, I have to say I’m extremely pleased with how fast Herschel has made the bike comfortable and compliant for Mathew. That’s not to say that it isn’t a huge team effort. All of our crewmembers contribute to the awesome package that Pop (team owner Tryg Westby) decided to move forward with in the offseason. The whole effort has matured to a new level that is positioned to accept new challenges ahead. Mathew and the team will regroup and come back strong for round three of the 2019 MotoAmerica Superbike Championship, which takes place at VIRginia International Raceway in Alton, Virginia, on May 4 through 5. To say the Yoshimura Suzuki team had a good weekend in COTA would be an understatement. You couldn’t have written a better script for Suzuki in the combined MotoGP/MotoAmerica weekend at the Circuit of the Americas. At the biggest motorcycle racing event in America, Yoshimura Suzuki Factory Racing came away with all of the first-place trophies, winning both MotoAmerica Superbike races as well as Superpole. Jake Lewis at speed on the M4 ECSTAR Suzuki at COTA. MotoAmerica AMA/FIM North American Road Racing season opener with a second consecutive sixth-place finish in Saturday’s MotoAmerica Superbike race at the Circuit of The Americas. Running alongside the MotoGP World Championship, Lewis did well in the 15-lap race with the eyes of the motorsports world focused firmly on Austin, Texas, this weekend. The Kentuckian got off to a strong start aboard his M4 ECSTAR Suzuki GSX-R1000 after starting on Row 3. He quickly picked up another position to take over fifth place and ran as part of the lead group early in his bid to score his first top-five of 2019. However, Lewis’ pursuit ultimately ran out of steam as tire wear increased, and he fell into a relatively lonely ride to sixth where he would finish. Lewis was upbeat after the race and feels there’s still room for improvement ahead of tomorrow’s rematch. He said, “Overall, this weekend has been quite a bit better than last weekend. We struggled some in Atlanta, but the Circuit of the Americas is definitely one of the tracks that I really like, and we’re making progress with the bike and the electronics step-by-step. We’ve been working hard and the M4 ECSTAR Suzuki guys have been putting in a lot of great work and effort for me. “I knew I had the speed to run inside the top five. I got off to a good start and learned some things. A little past halfway, I encountered a few issues as the tires wore and that made the bike harder to ride. Meanwhile, Bolivian Felipe MacLean made his 2019 MotoAmerica debut in a wild card ride on the second M4 ECSTAR Suzuki GSX-R1000. MacLean put in a points-paying ride on Saturday, finishing in 14th position. Lewis and MacLean will be back in action again on Sunday in Superbike Race 2 to conclude the combined MotoAmerica and MotoGP weekend at the Circuit of the Americas. Travis Wyman made his MotoAmerica Superbike debut at COTA. It was a successful Superbike debut for Travis Wyman, and he did it at one of the biggest motorcycle road racing events of the year. The Weir Everywhere Racing BMW rider and Las Vegas resident nabbed a top-10 finish a narrowly missed out on another in his debut in the MotoAmerica series’ headliner class. In front of tens of thousands of fans who gathered at the Circuit of the Americas to watch the stars of FIM MotoGP race on American soil, Wyman showed poise and determination as he pushed the team’s BMW S 1000 RR harder than he ever has. The team made the most of its time sharing the track with the fastest road racers in the United States. While Wyman collected positive on-track results, the team used the track time to collect data on its BMW package and experiment with new suspension and geometry set ups. Wyman ended Friday’s qualifying practice sessions in 12th place and was running as high as ninth-place in Saturday’s Race 1, but had to settle for an 11th-place finish. In Sunday’s Race 2, Wyman scored a top 10 finish, crossing the finish line in ninth place. It was Wyman’s first time racing a literbike at Circuit of the Americas, but he relearned the track quickly. His fastest lap time in Sunday’s Race 2 was more than two-tenths of a second faster than his best time during qualifying. The team returns to Stock 1000 Class competition at the next round of the MotoAmerica series, which takes place May 4-5 at VIRginia International Raceway in Alton, Va. Wyman scored a commanding win at the picturesque facility in 2018 and is aiming for similar results this year. The team thanks Motul for their support in the 2019 season. Motul is the official oil and lubricant supplier of Weir Everywhere Racing BMW, and its products one of the reasons the team’s BMW S 1000 RR performs at a high level race after race.